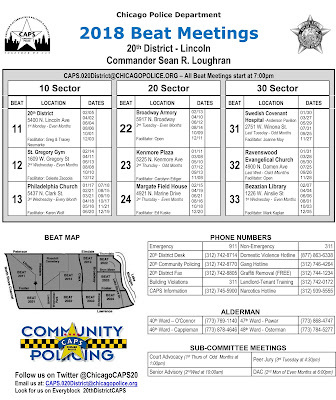 Both the 19th District and 20th District have released schedules for 2018's bimonthly CAPS beat meetings, when you can take the opportunity to talk to your beat cops and exchange information about what is going on in your area. 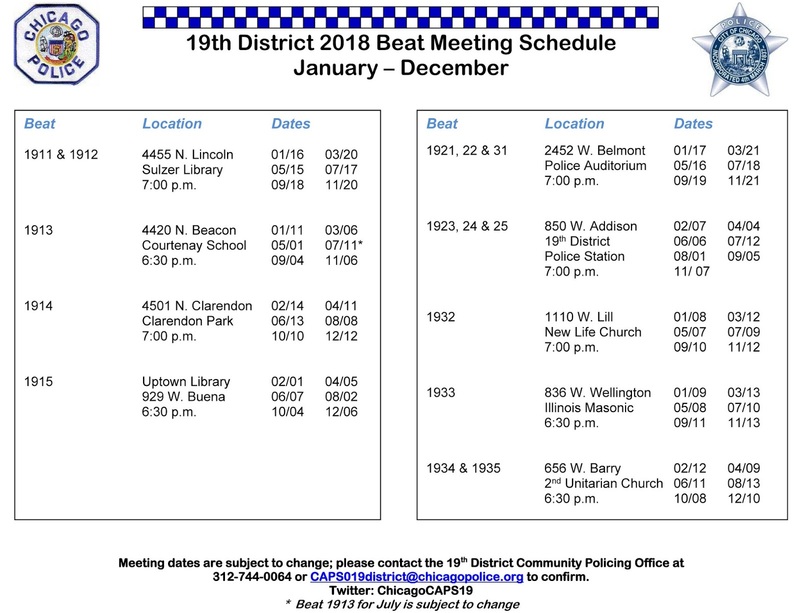 Beat 1912 - the area bordered by Lawrence, Clark, Irving Park, and Damen. 2018 meetings are held on the third Tuesday of odd-numbered months. 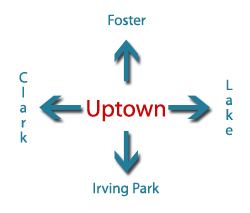 Beat 1913 - the area bordered by Lawrence, Broadway, Montrose, and Clark, essentially all of Sheridan Park. 2018 meetings are held on the first Tuesday of odd-numbered months, with the exception of January's meeting, which will be held on Thursday, January 11th. The July meeting date is subject to change. Beat 1914 - the area bordered by Lawrence, the lake, Montrose, and Broadway. 2018 meetings are held on the second Wednesday of even-numbered months. 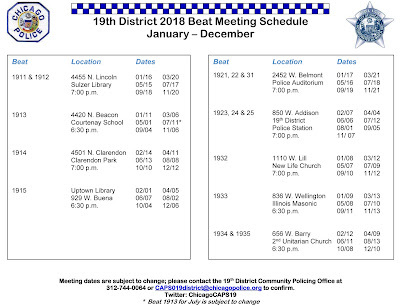 Beat 1915 - the area bordered by Montrose, the lake, Irving Park, and Clark, essentially all of Buena Park. 2018 meetings are held on the first Thursday of even-numbered months. 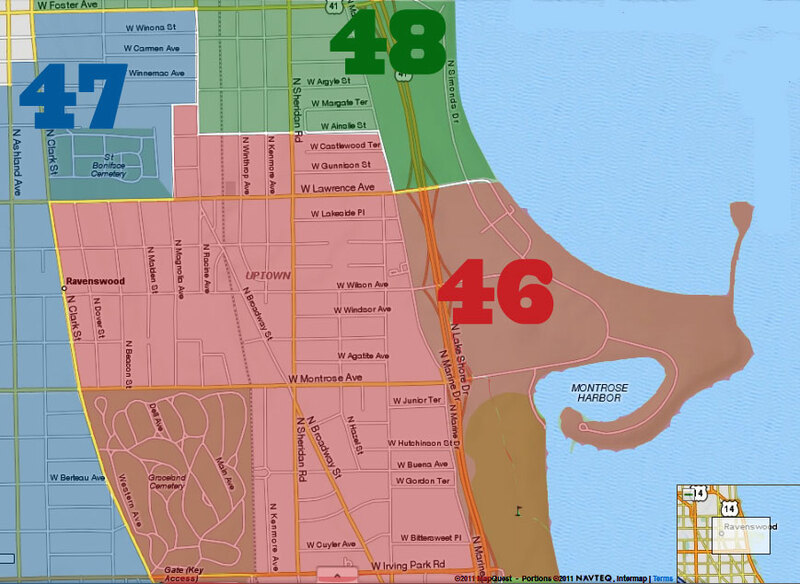 Beat 2024 - the area bordered by Foster, the lake, Lawrence, and Winthrop. 2018 meetings are held on the third Thursday of even-numbered months. 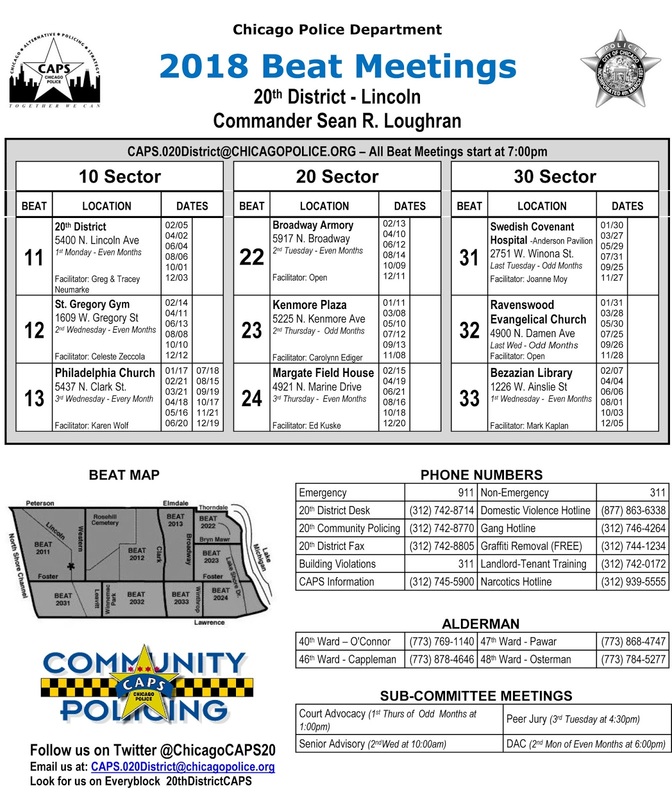 Beat 2033 - the area bordered by Foster, Winthrop, Lawrence, and Clark. 2018 meetings are held on the first Wednesday of even-numbered months.